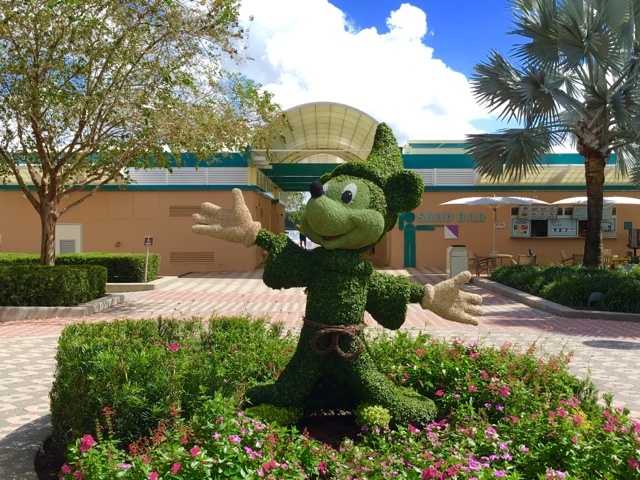 The World of Disney at Disney Springs is the largest Disney Store in the world. Everything about this location is big, including the giant figures hanging from the ceiling. 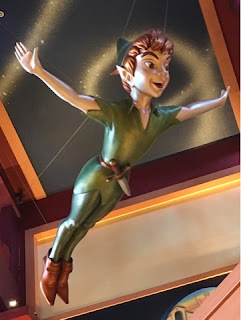 I took this shot of Peter Pan while walking through the store today. 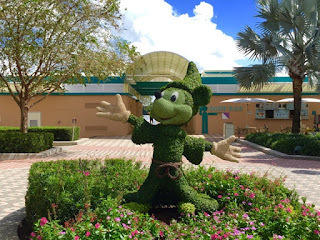 There are many fun topiaries around Walt Disney World. This one is located in the back of the Contemporary Resort. I took this shot a few weeks ago, while my guests were enjoying brunch at Chef Mickey's. 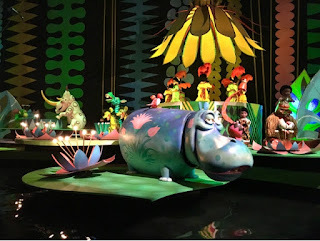 One of the most popular theme park attractions in the world is certainly "it's a small world." It is a classic ride that has been enjoyed by hundreds of millions of guests over the past 44 years. I had the chance to enjoy it with family a few days ago, when I took this shot. A few days ago, we were visiting with family at All-Star Movies. We had to catch an early bus to the Magic Kingdom. 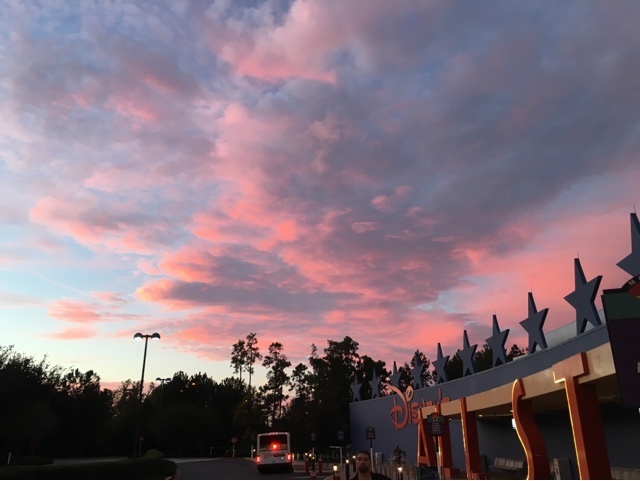 As the sun came up, the sky turned a very pretty color of pink. 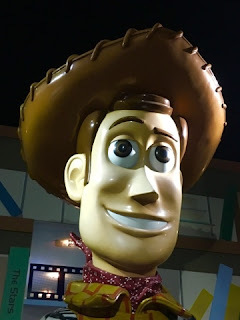 It is fun to see how Disney uses figures, voice actors, etc. in more than one attraction. This is the case with this "man" from the Jungle Cruise. 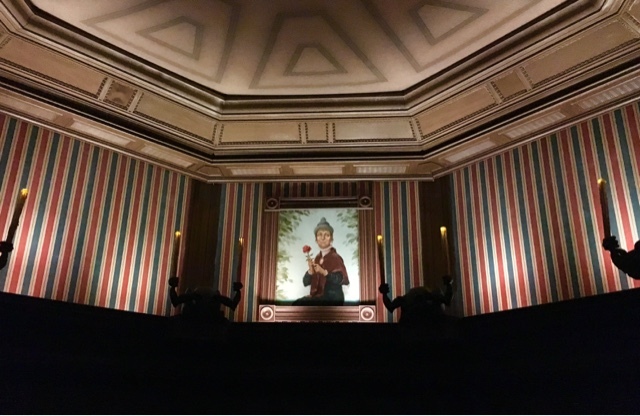 The same figure can be found in the graveyard scene of the Haunted Mansion, dressed in different clothes and standing with his dog. I took this shot this morning, while enjoying a cruise with family. I took this Bay Lake shot around sunset from the boat dock walkway at Wilderness Lodge. You can see the "Magic Kingdom I" boat that we just arrived on from the Magic Kingdom. 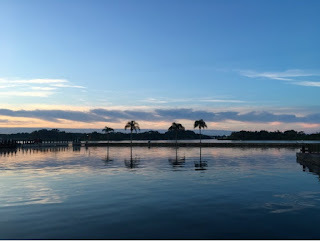 It was a beautiful night to be on the lake as the Central Florida humidity had begun to subside. Adventureland is one of my favorite places early in the morning. It is quiet and the sun is usually in a good spot for pictures. This was the case last week when I took this shot. 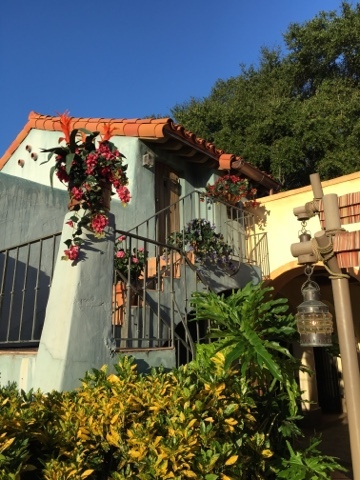 This area can be found near the exit of Pirates of the Caribbean. 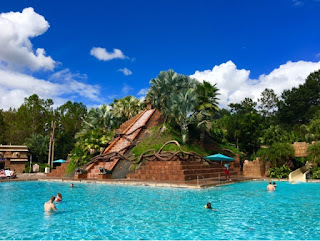 Here is another pic from my visit to Coronado Springs the other day. This is the "Dig Site" pool at the resort. The conditions were just about postcard perfect that day, and the sky was very blue. Tonight we visited All-Star Movies as we have family in town. They are staying in the Toy Story section of the resort. This gigantic Woody is right outside their door. Although a "value" resort, this property has some of the best theming in all of Walt Disney World. 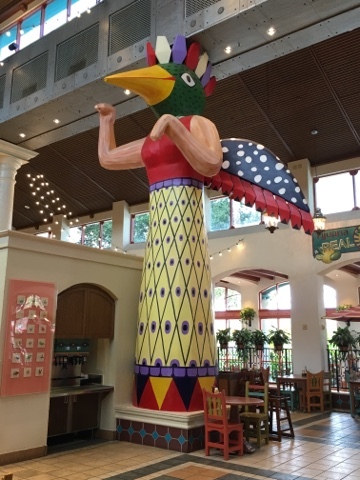 The Pepper Market is the quick-service dining location at Coronado Springs. It serves food with a southwest flare, which is in line with the theme of this resort. I took this shot of the giant "bird woman" sculpture today. As I was going thru photos that I took last week, I noticed the common theme of fire in several of them. You can see the moment of MK park opening at the railroad station. 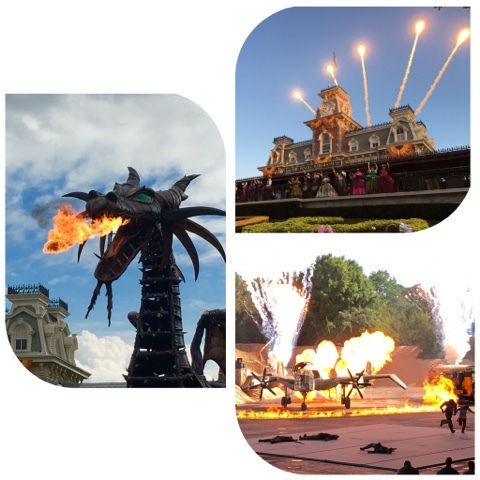 There is also the fire breathing dragon from the Festival of Fantasy parade. Finally, you see the finale explosion in the Indiana Jones Epic Stunt Spectacular at Hollywood Studios. 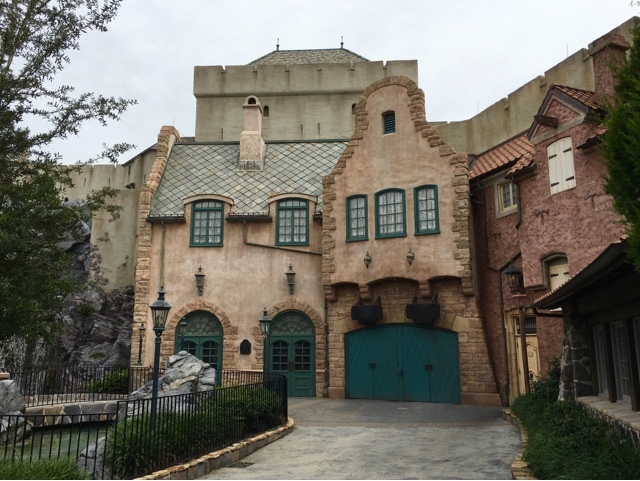 The drawing class known as the "Animation Academy" recently closed at Hollywood Studios. However, it popped up in an interesting new (but temporary) place. 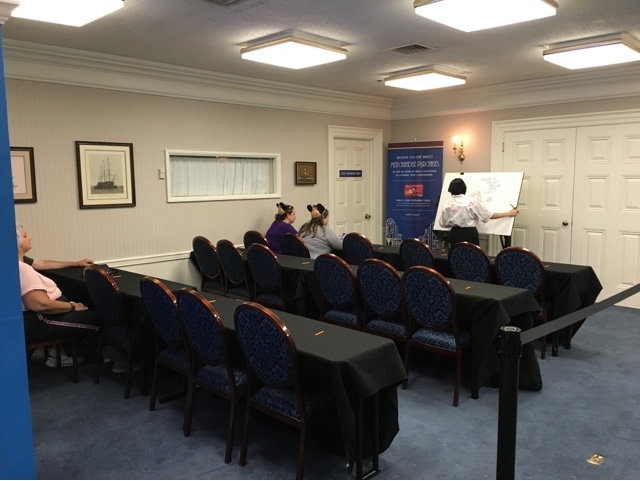 This class takes place at the Chase Lounge in the American Adventure building at Epcot, as part of the Food and Wine Festival. It happens a few times per week, but isn't on a set schedule. I took this shot on Friday. Although I have hundreds of pictures of Cinderella Castle, I'm always looking for a fun angle. I took this shot yesterday while waiting for my tour guests to finish lunch at the Crystal Palace. I like the way the porch was framing the castle. 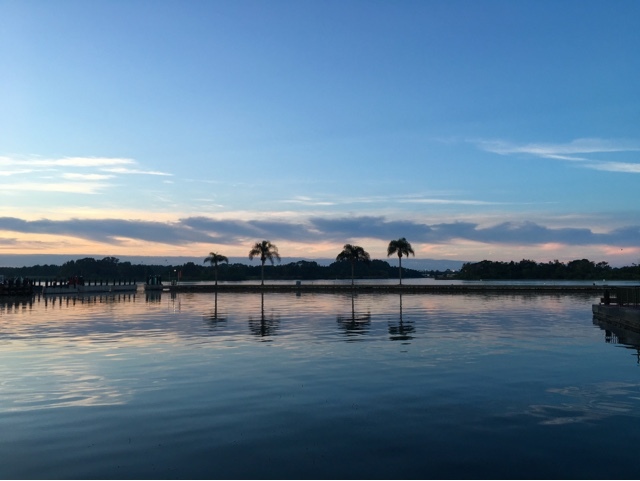 It was calm and quiet on the Seven Seas Lagoon this morning. If I turned 180 degrees, you would see the entrance to the Magic Kingdom, which is the busiest theme park in the world. There were already several thousand guests lined up at 7:30 to enter the "most magical place on earth." Today, I was standing outside of Norway while waiting for my tour guests to finish lunch at Akershus. It was amazing how quiet this area was, even though Epcot was very crowded. The pavilion is still undergoing a major refurbishment, with the new Frozen attraction still under construction. I can only imagine how this scene will change when it debuts next year. 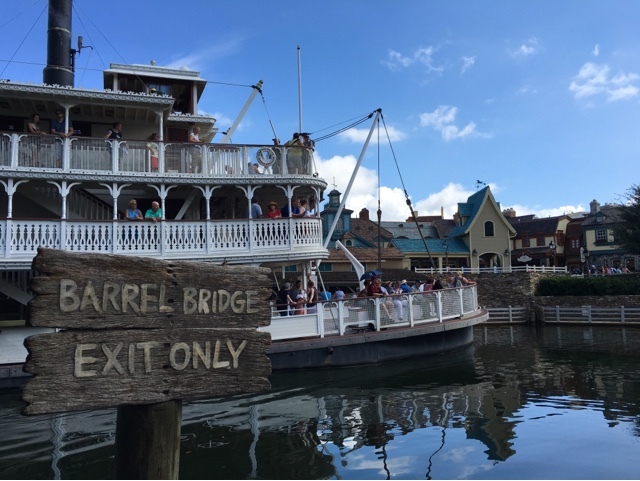 I don't think it is a stretch to believe that it will be the most popular attraction in the park when it opens. 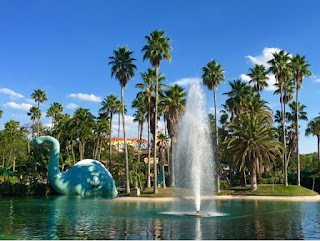 Near the center of Hollywood Studios is a small body of water called Echo Lake. 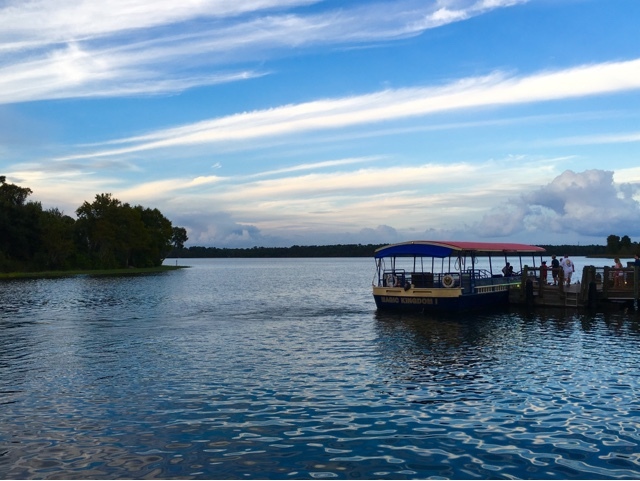 Although it is usually crowded around this area, it provides for some serene views. I took this shot while giving a tour today. 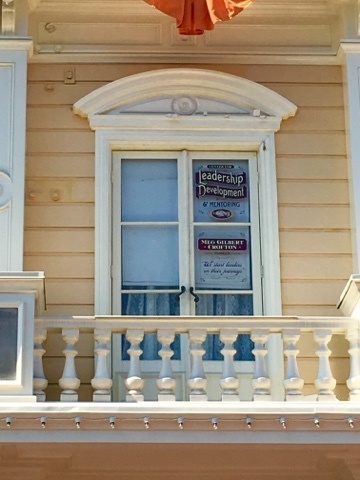 The windows on Main Street in the Magic Kingdom contain tributes to many important figures in the history of Walt Disney World. The most recent window was dedicated this morning. It is in honor of Meg Crofton, who was the President of Walt Disney Parks and Resorts from 2006, until she retired this year. Each afternoon, before the Festival of Fantasy parade, a grand marshal family is driven through the route in this old-fashioned car. These guests are typically chosen at random, and they get the memory of a lifetime. You may be wondering why I focused on the wheel of this vehicle. 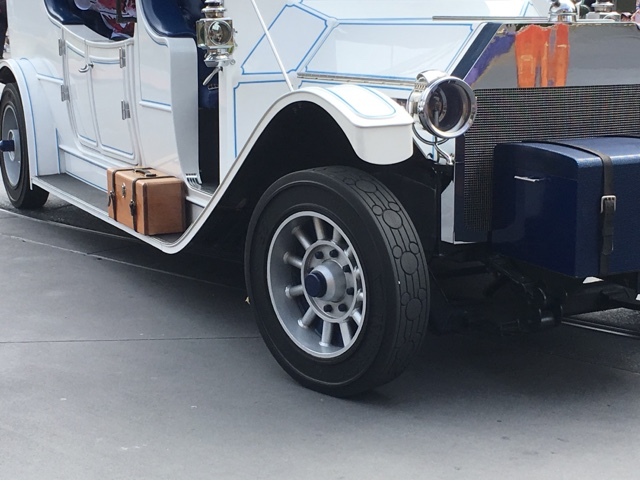 If you look closely, you will see the tread is full of hidden Mickey's. 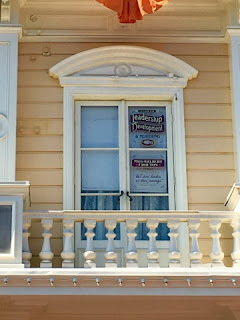 This is just another fun detail that most guests overlook. 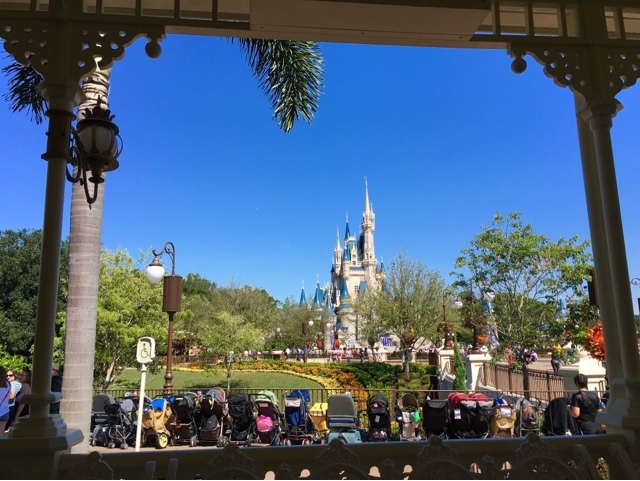 Today was a "picture perfect" day at the Magic Kingdom. 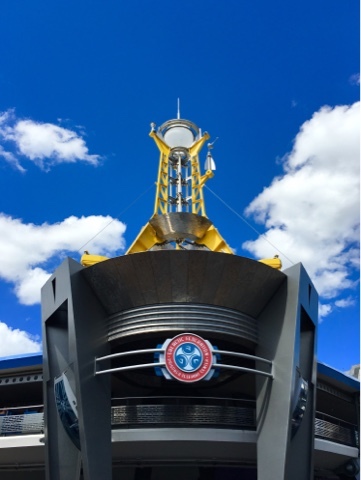 This tower is on the corner of Stitch's Great Escape in Tomorrowland. You can see the PeopleMover track just below the tower. The sign reads "Galactic Federation Prisoner Teleport Center." 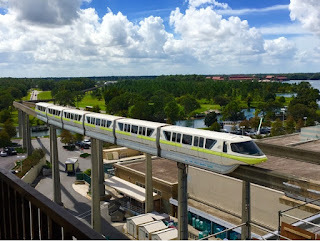 Here is a monorail shot that I took a few days ago. I was at the Contemporary in a stairway balcony on the 7th floor. My tour guests were enjoying brunch at Chef Mickey's, a few floors below. 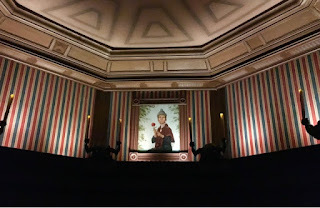 This shot was taken from the Haunted Mansion queue. You can see the suspension bridge at Tom Sawyer Island and Big Thunder Mountain in the background. I took the photo last week and the conditions were ideal. The humidity has started to break in Central Florida, and the drier air provides for better pictures. I was at the Contemporary today so I went to the roof for a few quick photos. The views are amazing from up there. You can see downtown Orlando in one direction and several Disney resorts in the other. 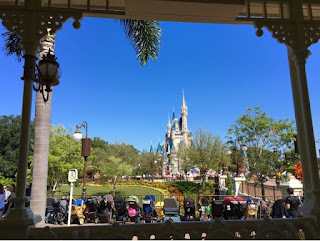 Many of the Magic Kingdom attractions are visible in this shot. 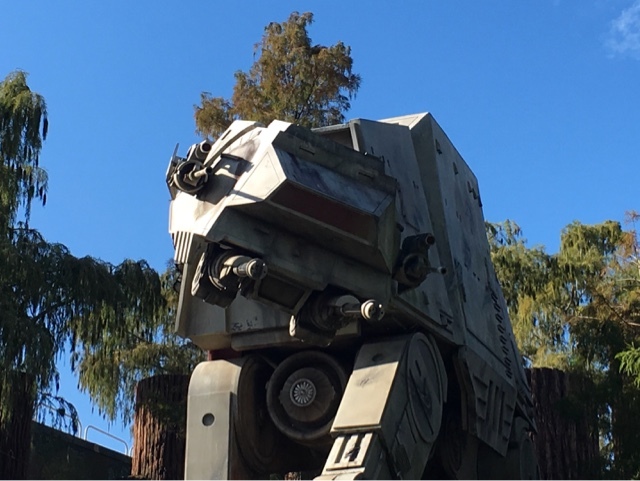 I took this shot of the AT-AT Walker in front of Star Tours today. This impressive "prop" adds to the feel of the area. However, the future Star Wars land coming to Hollywood Studios will surely dwarf what is there now. I took this shot from the top of Expedition Everest today. 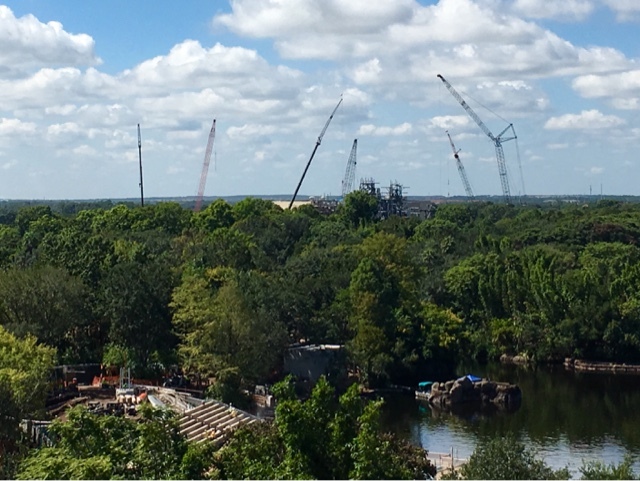 You can see the two major construction projects taking place at Animal Kingdom. The area with the cranes is the giant Avatar expansion on the west side of the park. The area at the bottom of the photo is the spot where the Rivers of Light show will take place. 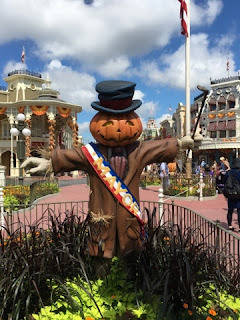 One of my favorite cast members at the Magic Kingdom is Mayor Christopher Weaver. He always has a smile and a corny joke for guests who approach him. This pumpkin scarecrow, which is part of the Halloween decorations, is a fun tribute to Mayor Weaver. 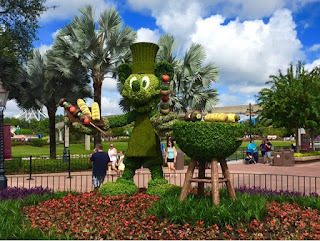 The Epcot International Food and Wine Festival is underway once again. This is one of my favorite times of year at Walt Disney World. This year, they have created a Chef Mickey topiary, which can be found in the area between Future World and World Showcase. I took this shot today while giving an Epcot tour. Lights, Motors, Action has been entertaining guests for over 10 years. Today I got a different perspective as I watched a portion of the show from an area where you can see "backstage." 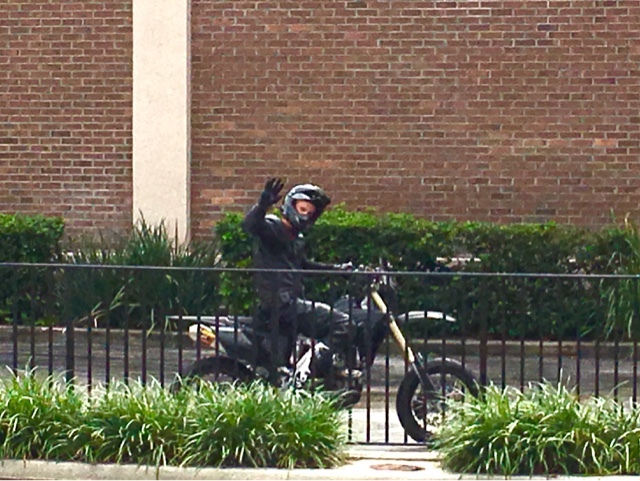 As this motor cycle stunt man came to this area to reverse his course, he took time to wave to me when he saw I was photographing him. 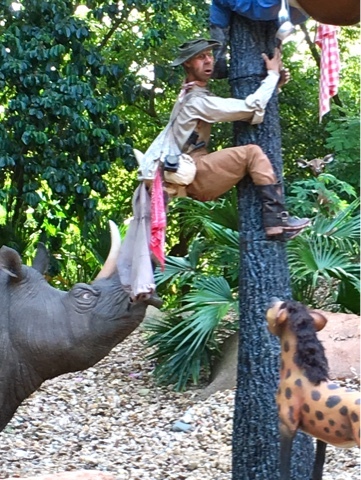 Today, I saw some interesting activity in Maharajah Jungle Trek while giving an Animal Kingdom tour. 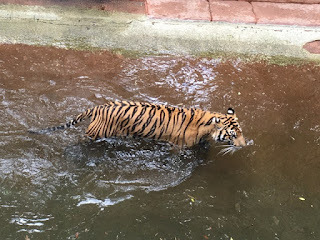 One Tiger was playing in the pool near the beginning of the trail, and another was in the water at the end. I have rarely seen a tiger in the water in this exhibit, so it was fun to see two on the same day. I recently upgraded to the iPhone 6s and wanted to try out its low light photo capability. So, I headed to my favorite attraction and took some shots. This one is from the stretching room. 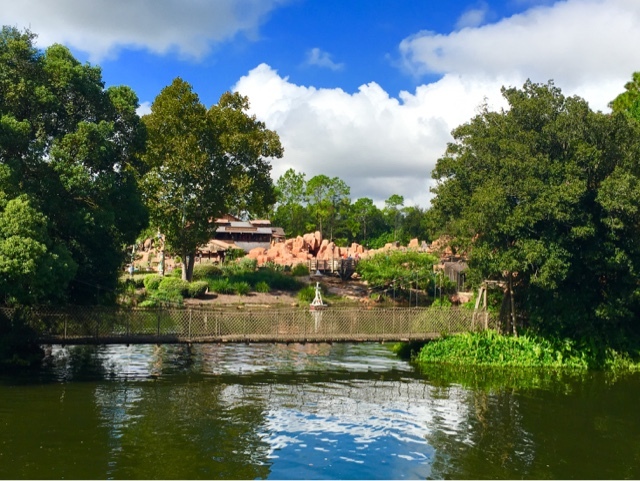 Some of the best views in the Magic Kingdom can be found while on Tom Sawyer Island. I took this shot from the southeast corner of the island today. You can see the Columbia Harbour House in Liberty Square in the background.